"This is an excellent pizza crust recipe. I have found it is really good when baked on a pizza stone." 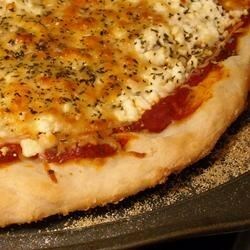 This recipe was very good,I added Italien seasoning to the toppings.I also tried doubling this recipe and made a few smaller pizza's to freeze for the kids,it worked great. This is the best crust recipe i've found so far. It was pretty good, though it was a little too much like a biscuit. I get all kinds of compliments on this pizza crust. It is so quick and easy. It is the best! I love the fact that it does not have to sit and rise. Wow! This is really good and super easy. I did sprinkle it with garlis powder. Thanks for sharing it! LOVE IT! Great crust - needed some flavor. I added some garlic and basil. It helped. I will make it again! i found that by putting the spices in the crust and on top made it really good.